Toss the leftover leaves that are pieces and place into the bottom of a nonstick roasting pan. 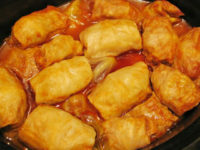 Layer the stuffed cabbage rolls over the cut/chopped/broken cabbage leaves. Bake in preheated oven until the ground beef mixture is no longer pink in the center, about 2 hours. Can’t tell the difference in taste and definitely saves time. You also just adjust flavors in your mind to what tastes good to you. More salt, more pepper and tons of garlic. Yummy! Now you know what to do with that giant head of cabbage?